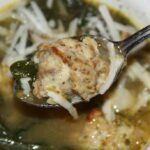 The best Italian Wedding Soup with flavorful chicken meatballs, pestata, and lots of vegetables. 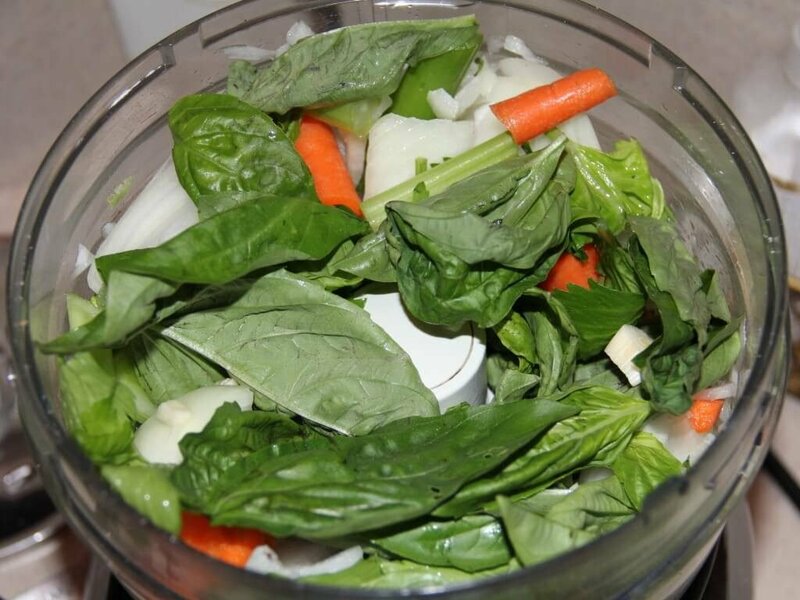 This soup is absolutely delicious, nutritious, and feeds a crowd! Nothing’s easier when feeding a crowd than a big pot of soup or chili or something you can do as a one-pot meal. 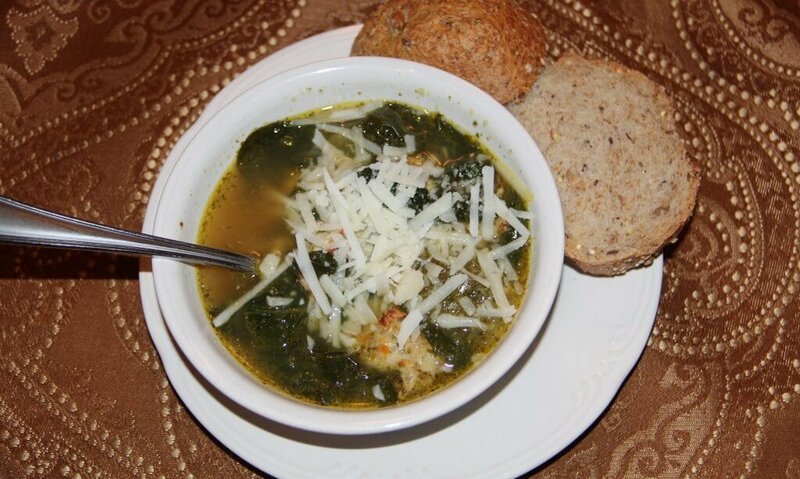 A few weeks ago, we hosted our lifegroup (what we call our church’s small groups) at our house and I made this delicious Italian wedding soup. It’s nutritious and great comfort food at the same time, a perfect combination in a soup. I used a combination of Lidia Bastianich’s recipe and Ina Garten’s recipe, pulling parts from each that I thought would be good and throwing in my own touches here and there. The end result was a flavorful broth filled with scrumptious chicken meatballs and spinach, along with Lidia’s pestata. 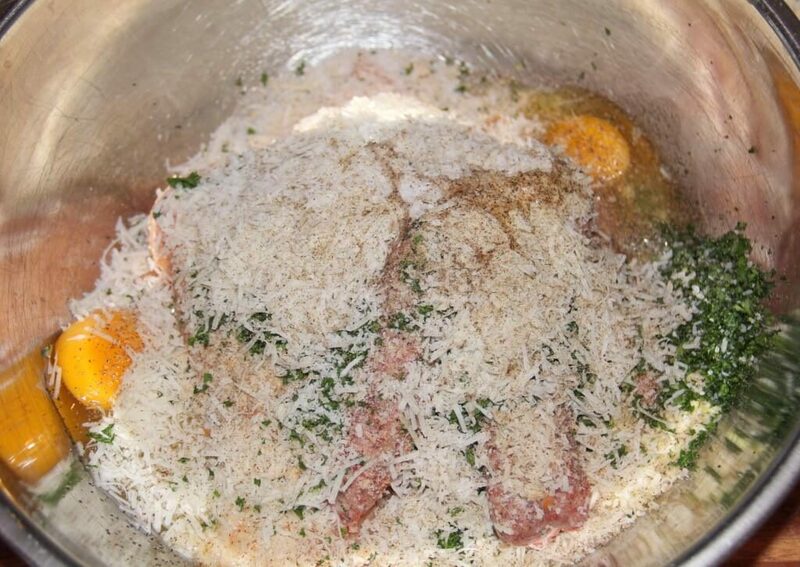 For the meatballs, you’ll need ground chicken, sweet Italian sausage, fresh bread crumbs, garlic, parsley, Pecorino Romano and Parmigiano-Reggiano cheeses, milk, eggs, and salt and pepper. Dump it all in a bowl and mix gently with a fork or your fingers. Using a teaspoon, scoop out 1-inch sized portions onto a cookie sheet lined with parchment paper. These are pretty small, but you want them that way for the soup. If I were making them to eat by themselves or with something else, I’d make them closer to golf ball size. 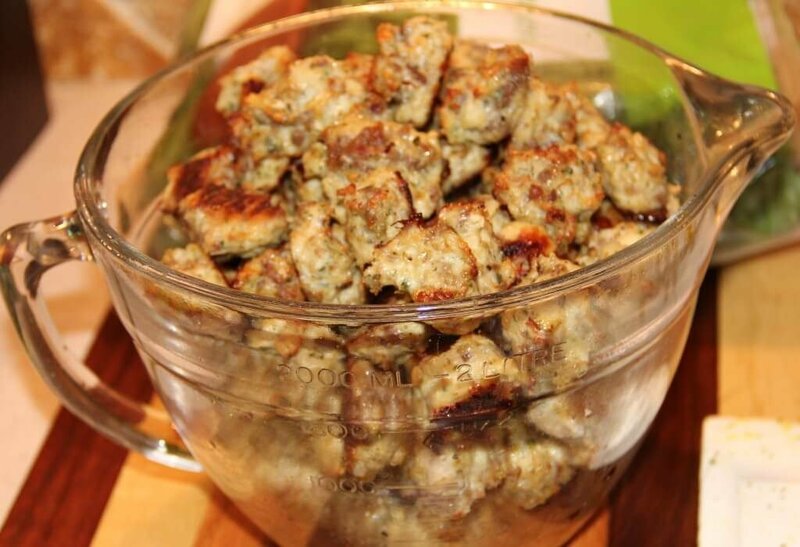 Bake the meatballs for about 30 minutes, until nicely browned. While the meatballs are baking, start the soup. 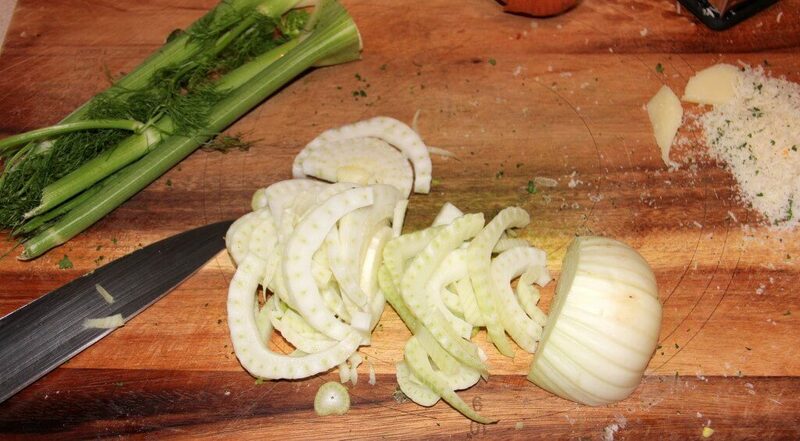 To make the pestata, you need basil, onion, celery, carrot, and garlic. Doesn’t that look pretty and fresh already? Mince it in the food processor until it becomes a smooth paste. Heat 1/2 cup of olive oil in a large stock pot over high heat and add the pestata. Cook for about five minutes, stirring the whole time, until the pestata starts to lose moisture and begins to stick a little. Pour in chicken stock and white wine and bring to a boil, scraping up the pestata and mixing well. Lower the heat and simmer for 15 minutes, then stir in fennel, zucchini and escarole. Add salt to taste. Return to a simmer and cook 45 minutes covered, then remove cover and simmer another 45 minutes. Drop in the meatballs and spinach. Simmer 5 more minutes, then add cubes of provolone cheese and serve. **Cook’s Tip: I used a mixture of freshly grated Pecorino Romano and Parmigiano-Reggiano cheese and served with a sliced whole grain bread. Enjoy! 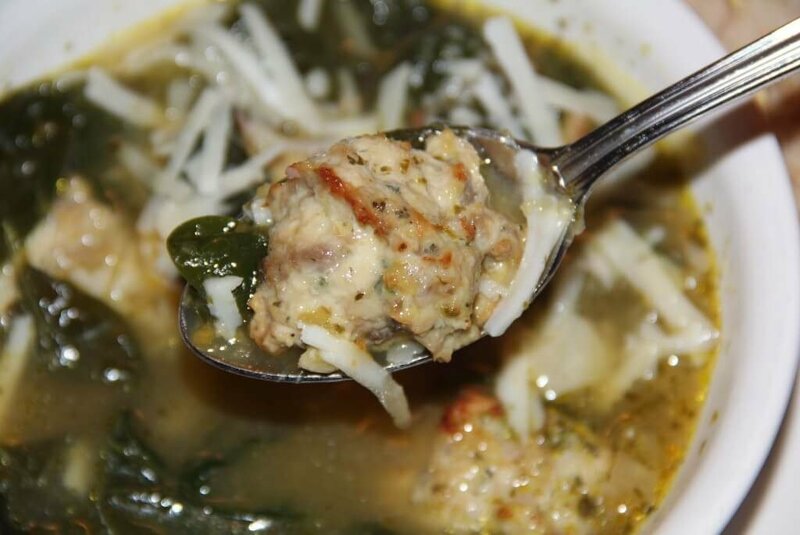 Italian Wedding Soup made with chicken sausage meatballs and escarole. Preheat oven to 350. Line 2 cookie sheets with parchment paper for the meatballs. 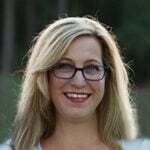 Place ground chicken, sweet Italian sausage, fresh bread crumbs, garlic, parsley, 1/2 cup Pecorino Romano and 1/2 cup Parmigiano-Reggiano cheese, milk, eggs and salt and pepper in a large bowl. Mix gently with a fork or your fingers. Using a teaspoon, scoop out portions about 1 inch size onto prepared cookie sheet. 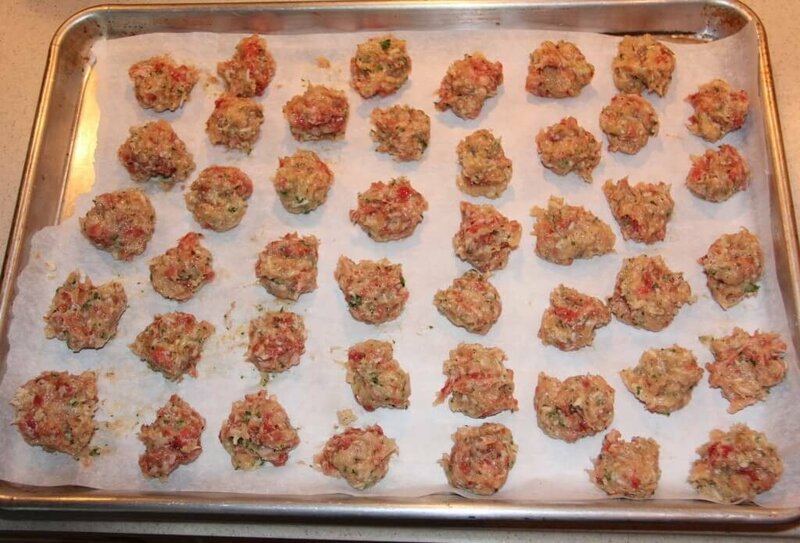 Bake the meatballs for about 30 minutes, until nicely browned. While the meatballs are baking, start the soup. 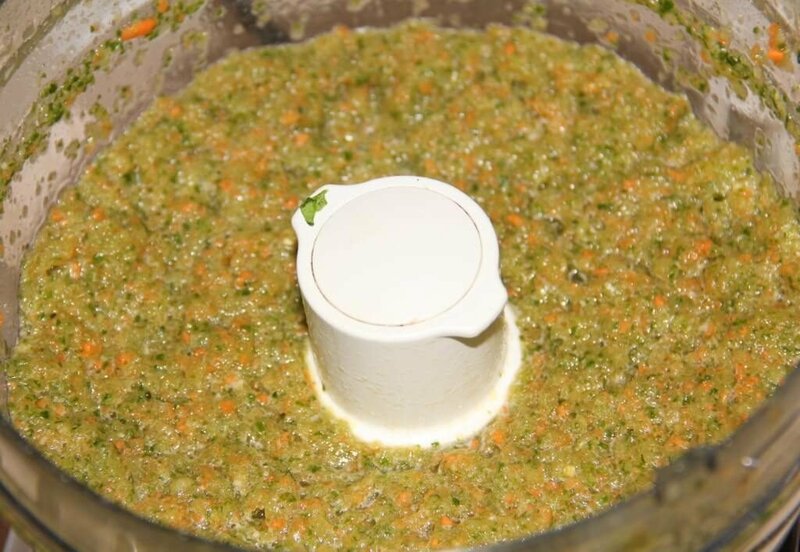 Place basil, onion, celery, carrot, and garlic in a food processor and mince into a smooth paste. 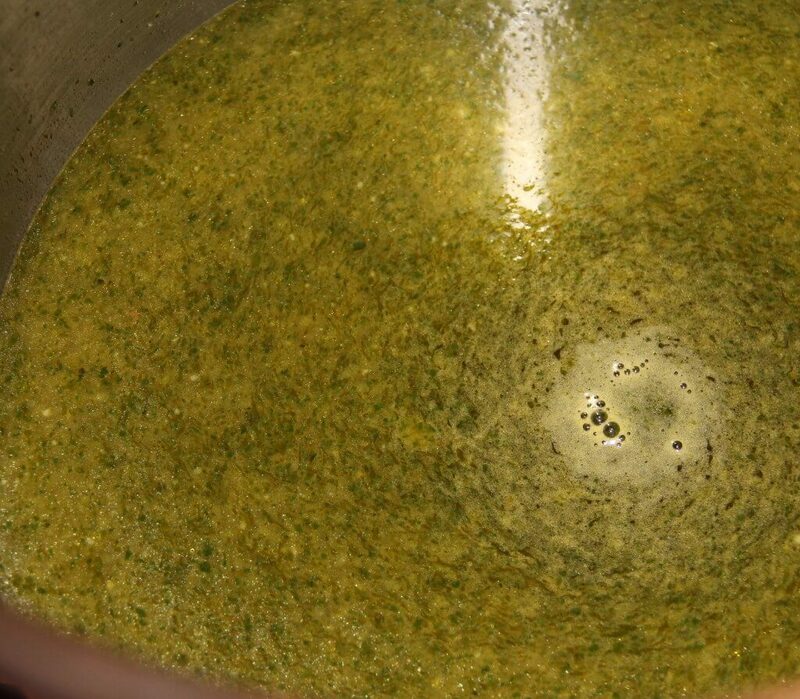 Heat 1/2 cup of olive oil in a large stock pot over high heat and add the pestata. Cook for about five minutes, stirring the whole time, until the pestata is starting to lose moisture and beginning to stick a little. Pour in chicken stock and white wine and bring to a boil, scraping up the pestata and mixing well. Lower the heat and simmer for 15 minutes then stir in fennel, zucchini and escarole. Return to a simmer and cook for 45 minutes, covered. Remove cover and simmer another 45 minutes, then drop in the meatballs and spinach. Simmer 5 more minutes, then drop in cubes of provolone cheese. Serve with a mixture of freshly grated Pecorino Romano and Parmigiano-Reggiano cheese and hearty, whole grain bread. Previous Post: « What Will You Leave Behind? Great recipe development! I’m definitely trying this soon.